The winepress of Gods wrath – I Am Not Ashamed Of The Gospel Of Christ! 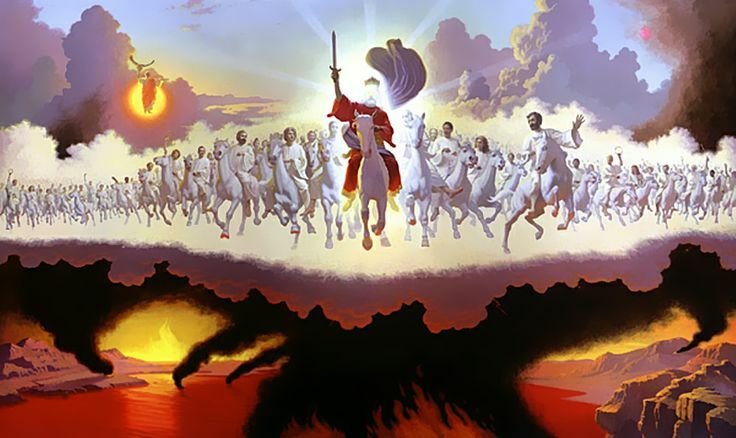 There will be a time when the last and final chance for man to repent and come to the Lord will end.Although it is hard to understand that even after many are killed and such devastation will cover the earth,still there will be those who will not repent (Revelation 9:20,21).At the time when the harvest of the earth arrives the great winepress of the wrath of God will of gathered the vines of the earth for the grapes will be fully ripe.The river of blood will be as deep as four to five feet that is the height of a horses bridle and will flow the length of two hundred miles (one thousand six hundred furlongs).This is not a pretty picture,but is the truth of scripture (Revelation 14:14-20). 14 And I looked, and behold a white cloud, and upon the cloud one sat like unto the Son of man, having on his head a golden crown, and in his hand a sharp sickle.15 And another angel came out of the temple, crying with a loud voice to him that sat on the cloud, Thrust in thy sickle, and reap: for the time is come for thee to reap; for the harvest of the earth is ripe.16 And he that sat on the cloud thrust in his sickle on the earth; and the earth was reaped.17 And another angel came out of the temple which is in heaven, he also having a sharp sickle.18 And another angel came out from the altar, which had power over fire; and cried with a loud cry to him that had the sharp sickle, saying, Thrust in thy sharp sickle, and gather the clusters of the vine of the earth; for her grapes are fully ripe.19 And the angel thrust in his sickle into the earth, and gathered the vine of the earth, and cast it into the great winepress of the wrath of God.20 And the winepress was trodden without the city, and blood came out of the winepress, even unto the horse bridles, by the space of a thousand and six hundred furlongs. This may not be a subject we’d rather not know about,but it is going to come to pass just as all other words of scripture do.May this move us to repentance before the year of the redeemed comes,and the vengeance of God’s wrath be poured out! (Isaiah 63:1-9). Who is this that cometh from Edom, with dyed garments from Bozrah? this that is glorious in his apparel, travelling in the greatness of his strength? I that speak in righteousness, mighty to save.2 Wherefore art thou red in thine apparel, and thy garments like him that treadeth in the winefat?3 I have trodden the winepress alone; and of the people there was none with me: for I will tread them in mine anger, and trample them in my fury; and their blood shall be sprinkled upon my garments, and I will stain all my raiment.4 For the day of vengeance is in mine heart, and the year of my redeemed is come.5 And I looked, and there was none to help; and I wondered that there was none to uphold: therefore mine own arm brought salvation unto me; and my fury, it upheld me.6 And I will tread down the people in mine anger, and make them drunk in my fury, and I will bring down their strength to the earth.7 I will mention the lovingkindnesses of the Lord, and the praises of the Lord, according to all that the Lord hath bestowed on us, and the great goodness toward the house of Israel, which he hath bestowed on them according to his mercies, and according to the multitude of his lovingkindnesses.8 For he said, Surely they are my people, children that will not lie: so he was their Saviour.9 In all their affliction he was afflicted, and the angel of his presence saved them: in his love and in his pity he redeemed them; and he bare them, and carried them all the days of old.